Bill McGuire makes shooting look easy and smooth with little gun movement. 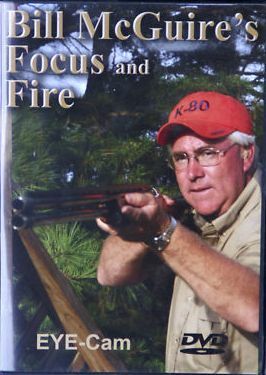 His pre-mounted method of shooting is very simple and extremely easy to learn; it depends on a good plan for each target and efficient use of the eyes and hands. In this video, Bill teaches you how to diagnose any target presentation and develop a plan that will end with Xs on your scorecard. Once you put Bill’s method into use, you will have the ability to hit any target you encounter. Sunrise Productions’ EYE-Cam makes learning Bill’s shooting method easy to master. The EYE-Cam allows you to follow Bill’s eyes and see where he first focuses on the target; you will see the gun move to the target, the lead established and the shot taken. This presentation gives the viewer the best EYE-Cam footage ever filmed.